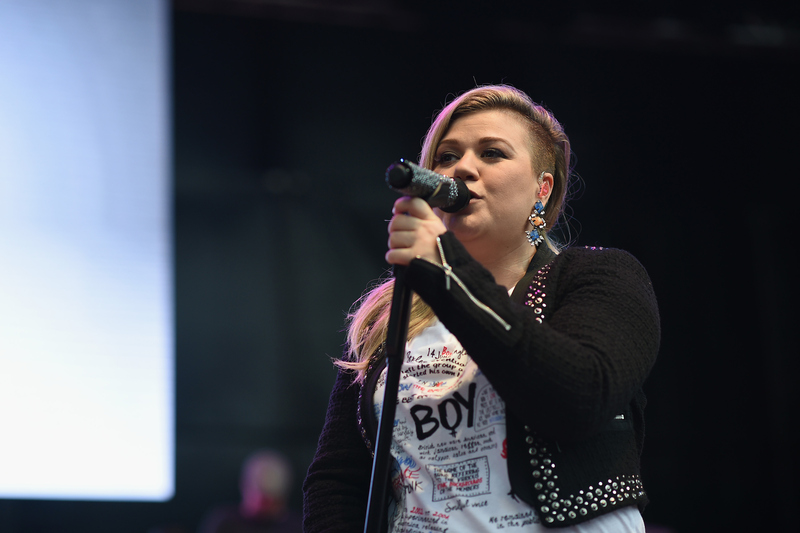 By this point, Kelly Clarkson has pretty much established that any song she covers, she slays. (If you need proof, look no further than Clarkson's cover of "Blank Space" by Taylor Swift or "Stay" by Rihanna.) Naturally, when Clarkson performed "Heaven" by Bryan Adams, she more than did justice to the extremely romantic song. "I chose this one because this is my husband's, one of his favorite songs," Clarkson told the audience of her Aug. 8 concert in Salt Lake City. "And he's here tonight ..."
"Heaven" certainly didn't disappoint, and it's the latest in a long line of spectacular covers by Clarkson. No matter how random the song choice (I'm looking at you, *NSYNC's "Bye Bye Bye"), the American Idol winner never fails to use her incredible vocal talent and personality to make it her own. "Heaven" is a popular song to cover, so Clarkson had her work cut out for her. However, as you'll see in the video below, she slays. Jason Aldean teamed up with Bryan Adams to perform an unexpected, yet stunning, rendition of "Heaven." American Idol runner-up David Archuleta sounded wise beyond his years in this stripped-down cover of "Heaven." Gavin DeGraw's audience joined him in a simple, yet beautiful, performance of "Heaven." Mia Rose shows that an understated version of "Heaven" can still be packed with emotion. Megan Nicole teamed up with Boyce Avenue for a supercharged rendition of "Heaven." Jake Worthington did Team Blake proud on Season 5 of The Voice with his soulful over of "Heaven." No matter their style or theatrics, everyone on the list above did "Heaven" proud.